TEHRAN (Fars News, Tehran Times) — Iranian Railways (IRIR) and Uzbek Railways, the national rail carrier of Uzbekistan, signed an agreement on discount for transit of commodities, according to Mohsen Pour-Seyed Aqaii, the managing director of IRIR. Iran participated as a supervisory member in the gathering, which was held in the Uzbek capital city of Tashkent from November 4 to 5. 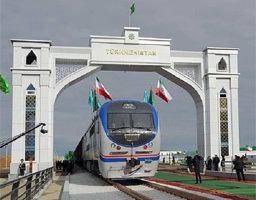 Uzbekistan is working on developing closer relations with its southern neighbours and signed intergovernmental agreements on a transportation corridor with Turkmenistan, Iran and Oman, in August 2014. Iran is enthusiastic about the project and has already proposed its intention to start deliveries of oil to Uzbekistan via this planned north-south route. Tehran promises to ship up to one million tons of oil per year “via the Uzbekistan-Turkmenistan-Iran-Oman transport corridor” to cover the supply shortage Uzbekistan normally imports from Kazakhstan and Russia. Speaking in the margines of the gathering of the representatives of Commonwealth Independent States (CIS)’s railway administrations, Pour-Seyed Aqaii declared according to the agreement, discount is allocated to the goods that Iran transports via Uzbekistan and those that Uzbekistan transports via Iran. “We had also meetings with some officials of Uzbekistan such as the chairman of Iran-Uzbekistan Joint Economic Commission to boost transit of goods via Iran and Uzbekistan”, Pour-Seyed Aqaii stated. Last June, the two countries agreed to transit 400,000 tons of cotton and 300,000 tons of fertilizers from Uzbekistan in the current year and increase the transit of fertilizers to one million tons in the coming years. According to the Iranian Customs Administration, Uzbekistan was the 30th importer of Iranian non-oil goods during the first half of the current Iranian calendar year (March 21-Septemebr 22). Iran exported $47.108 mln of non-oil goods to Uzbekistan and imported $14.16 mln of non-oil goods from the country in the mentioned period of time. Uzbekistan was also ranked 28th as importer of Iranian non-oil goods in the previous Iranian calendar year, which ended on March 20, with importing and exporting $103.77 mln and $63.3 mln of non-oil products from and to Iran.